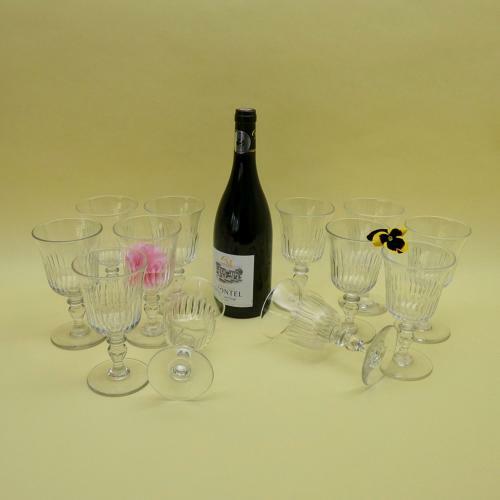 A superb, set of twelve, French crystal wine glasses. These are an excellent, heavy quality crystal and they date from c.1890. Each glass has a long, elliptical cut to the bowl of the glass and a baluster shaped stem. The measure approximately 15.6cm. high by 8.5cm. diameter at the rim and 7.8cm. diameter at the foot. There are very minimal variations between the glasses as they are hand blown. It is good to find such a large set of period glasses and they are all in excellent condition.